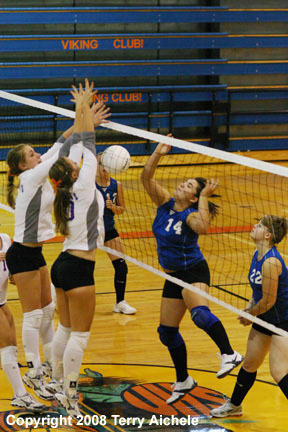 UMATILLA - The Burns Highlanders (3A Eastern Oregon League) traveled to Umatilla (3A Eastern Oregon League) on Saturday for volleyball action. Burns won all three 25-12, 25-6, 25-12. Umatilla started the first set pretty well. The Vikings were tied with the Highlanders 5-5. From that point on the Highlanders outscored the Vikings 12 to 2 to take a 17-7 lead just past the midway point of the game. The strong front line and good serves by the Highlanders were too much for the Vikings to counter. Umatilla showed some nice play making in the first and third sets they just couldn't overcome the control that Burns showed in their shot making. LEFT - Kassandra Kennedy goes to one knee for a dig shot. 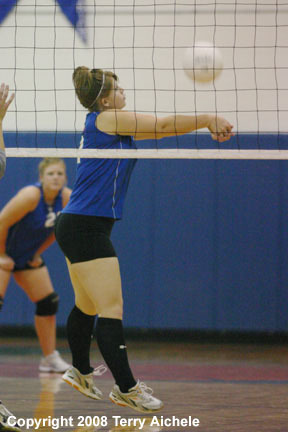 RIGHT - The Burns Highlanders successfully block a shot by BreAnna Watson. 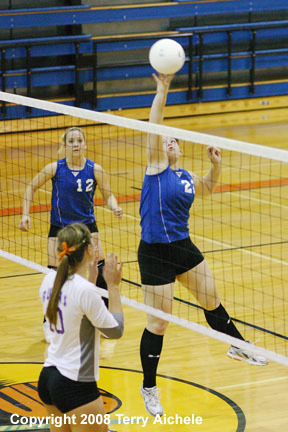 LEFT - Samantha Galbraith of Umatilla hits the ball. RIGHT - Katelynn Schaefer-Cranston of Umatilla goes to one knee for a dig. 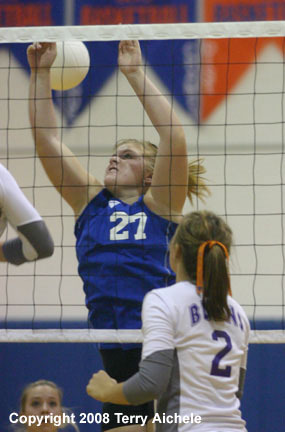 LEFT - Kaitlin Kennedy battles a the net to block a shot. 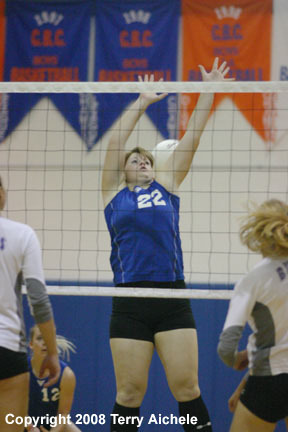 RIGHT - Samantha Galbraith attempts to block a spike at the net.